[O]f the more decided and complete creations of species, genera, and entire families of plants and animals, can they not have taken place continuously, and does it not insultingly restrict the creative power to maintain that, having in a way broken his molds and tired of producing, he would no longer be able to modify and increase his work? (42, “Création” in Dictionnaire classique des sciences naturelles). 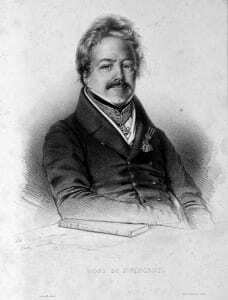 Jean Baptiste Genevieve Marcellin Bory de Saint Vincent (Bory) was a vocal and important French supporter of materialist transformist thought in the early 19th century. In keeping with the biographical norm for many of the most influential 19th century naturalists, Bory served as the naturalist on board a naval expedition from , later publishing a travel narrative, Voyage dans les quatre principals iles des mers d’Afrique (1804). Bory’s astonishment at the high levels of animal and plant endemism in the Mascarene Islands led him to muse on the possibility of an evolutionary world, asking “How did greenery come to shade an isolated volcano?” Much of what is known of Bory’s evolutionary thought is revealed in his entries in the multivolume Dictionnaire classique des sciences naturelles, which he edited in the 1820s. Bory was a frequent contributor to the Dictionnaire, writing on such topics as “Creation,” “Natural History,” “Geography,” “Man,” “Orang,” “Instinct,” and “Intelligence.” Of particular interest is the fact that Bory’s Dictionnaire is known to have been on board the Beagle with Charles Darwin. Unlike other evolutionists such as Leopold von Buch (1825) and Charles Darwin who concluded that islands are colonized by long distant transport of species from neighboring mainlands, Bory explicitly rejected this possibility. Instead, he proposed a theory of multiple “modern creations” of life on isolated islands that involved instances of spontaneous generation from which more complex life forms then developed via Lamarckian transformism. Importantly, for Bory, the process of evolutionary innovation involved “individual aberrations” which become permanent and give rise to new species. Thus, variation is central to his evolutionary speculations. Bory also argued that evolutionary advances must take place within a strict order, or ecological succession, in which early-appearing “primitive species” prepare the ground for “newer” (more complex) species which rely on these pioneers for their own survival. Bory’s transformist views did not go unnoticed. In an 1805 anonymous review of Voyage dans les quatre principals iles des mers d’Afrique published in the Edinburgh Review, the author describes Bory’s theory of multiple spontaneous creations as “unphilosophical” and “by no means countenanced by fact.” It is interesting to note that the subsequent 1805 English translation of Voyage (Voyage to, and travels through the four principle islands of the African seas) lacks many of the evolutionary bits of its original French . Bory drew support for his theory of separate creations from the multiplicity of forms that he witnessed among island flora, remarking that he had seen more polymorphic species on Reunion Island, than on any mainland continent. For him, the highly variable island floras were proof of their more recent origin – there had not been sufficient time for the traits of these young labile species to evolve towards more fixed (less variable) forms. Bory’s comments on the general similarities of microscopic species around the globe suggests a strong belief in mechanistic similarities in the generation of life (as did his later reliance on reports of spontaneous generation based on faulty experiments involving putatively sterile water). Conversely, Bory felt that the diversity and dissimilarity of more derived species around the world was a consequence of the unique and specific interplay of climate and physical environment found on each island or land mass. Bory de Saint Vincent’s map of Tenerife, 1803.